Canadian soldiers in the village of Holten, Netherlands, April 8th 1945. 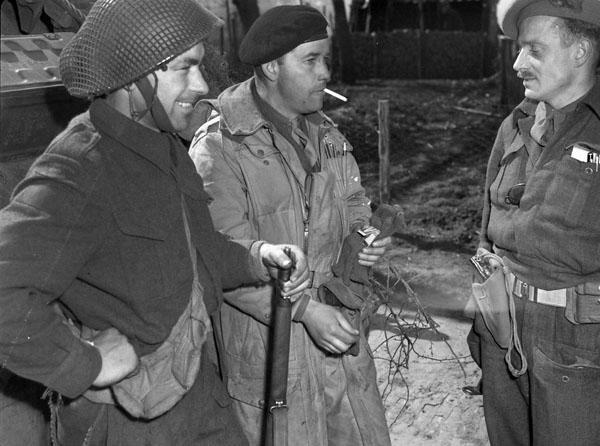 (Left To Right): Private Ernest Bold of “D” Company, The Black Watch (Royal Highland Regiment) of Canada; Major R.G.W. Hjalmarson, Troop Leader with The Fort Garry Horse; Captain B. Lewis, Officer Commanding “D” Company, The Black Watch (Royal Highland Regiment) of Canada.